Mega Sale! 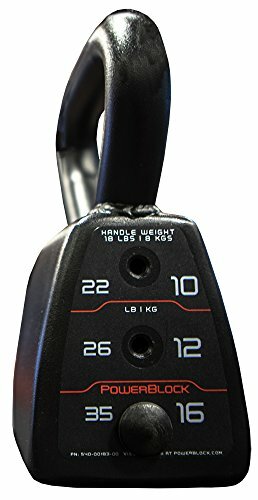 Save 21% on the PowerBlock Adjustable Kettlebell, Black, 35 lb by Power Block at Strongman Pictures. MPN: 540-00183-00. Hurry! Limited time offer. Offer valid only while supplies last. We asked our engineers to develop the most ergonomic adjustable Kettlebell ever. Mission accomplished! contoured shell provides exceptional comfort. We asked our engineers to develop the most ergonomic adjustable Kettlebell ever. Mission accomplished! contoured shell provides exceptional comfort. Feels like a solid iron Kettlebell with the advantages of adjust-ability. Replaces 4 Kettlebells in the space of 1; 18, 22, 26 and 35 lbs. Extremely compact; 4.25"W x 5.75"L x 10"H. Handle diameter 1.29".